Usually, water and vampires do not mix, but this case is different. Frankly, the term “vampire” might be a bit of a misnomer, but whatever you call it, this is some deadly dangerous clay. Once it gets a little bit of moisture, it will absorb and control its victims body-snatcher-style in Sôichi Umezawa’s gleefully gruesome Vampire Clay (trailer here), which screens as part of Fantaspoa 2018 in Brazil. Due to earthquake damage, Yuri Aina is forced to relocate her prep school for prospective art students to a temporary shack. While digging in the back, she unearths a bag of dehydrated clay. Of course, she brings it inside, only to cast it aside. Alas, her star student, Kaori Hidaka findsit after returning from a Tokyo workshop. She adds water and then all Hell breaks loose. As the mystery man skulking about outside eventually reveals, the killer mutant clay was produced by Minoru Mitazuka, the previous occupant of the ramshackle studio. The critically maligned sculptor infused a special batch of clay with his toxic waste-contaminated blood and all the bad vibes he could muster. Now his evil spirit pursues victims, pouring into cuts and other openings in the skin. It is not pretty to watch, but Umezawa’s practical effects are certainly inventive and fantastically gory. Clay’s unapologetically simple and straight-forward narrative only serves as a clothesline on which Umezawa hangs each incident of slimy, pus-dripping body horror. Yet, the pure joy he obviously takes in his macabre craftmanship is contagious. Frankly, you have to laugh and shake your head in appreciation each time he tops his previous grotesquery. As an added bonus, Umezawa throws in a thimble’s worth of character development, offering some pluckiness in Hidaka and a little bit of human vulnerability in Aina’s backstory, but not so much that it would detract from the ghoulish business at hand. His makeup and effects are wildly gross, but the design of Miktazuka’s sculptures is also wonderfully creepy. Nobody is going to call Vampire Clay “post-horror” anytime soon. This is your basic blood-splattered red meat, but you have to give Umezawa credit having such a distinctive vision. This film has an unmistakable look and aesthetic, which is definitely something. 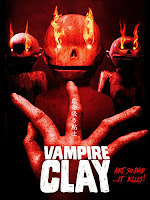 Recommended for fans of body horror and mutation movies, Vampire Clay screens Friday evening (6/1) at this year’s Fantaspoa (and it is already available on VOD here in America).